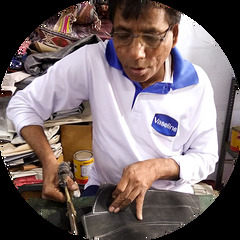 Indian craftspeople used lots of misprinted leather jeans labels in this large messenger bag. A small security flap hides a zipper pocket on the large flap closure secured by Velcro. Lined in denim fabric, the inside has zipper that runs the length of the bag, creating secure second storage. Dense cotton fabric strap adjusts to up to 55 inches long. The bag is 15 by 12 by 4 inches.